Use the ‘BCC’ field for people’s names / addresses, so that a receiver cannot accidentally hit ‘reply all’, and so as not to share everyone’s address with everyone else. Set the font to the web-safe font, as decreed by the brand dept. Set the font-size appropriately, as decreed by accessibility / readability best practices. No documents / files should be attached, unless confidential documents must be distributed. Emails shall be text based. Documents can be published on the intranet and links provided in the email. Documents can be saved in a common shared area (possibly) and links provided, or in an open / private area of the appropriate document control system. First line, in italics, says to what groups of people the email has been sent. Sentences should be short, using fewer than 20 words. Sentences shall not ever exceed 30 words. Hyperlinks to intranet and web pages, as well as documents, can be ’embedded’ in ‘blue text’, rather than just pasted. Emails should be signed off with a named responsible person. Emails to mass mailing lists should be reviewed by a second pair of eyes – ‘proof reading’ and sense checking is better done by someone who isn’t ‘close’ to the message. It’s simple really – too simple. Any mistakes made when communicating to a large audience via email tend to be stupid mistakes. Email is so heavily relied upon that we all think we’re ‘good at it’, but we ain’t. These nine points come from the lessons I’ve learnt over the last few months. Thirty seconds after hitting the ‘send’ button, you can bet that someone will ask “can we bring it back and edit it?” – which they ‘know can be done’. It’s unlikely really. 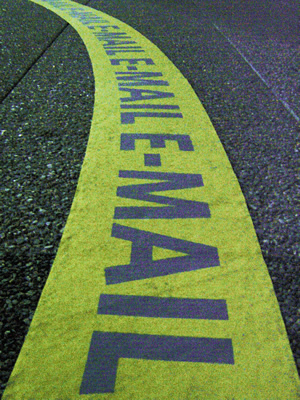 Emails and print communications have absolute deadlines – one cannot just make a change once the button has been hit. That’s why I advocate the use of intranet pages to communicate key messages. Pages can be updated, and an email can direct people to the specific page. Don’t pack an email with hundreds of words that won’t get read and can’t be amended when a web page is more accessible, easier to refer to in the future, and can be fixed if something goes wrong. Got any tips – or horror stories – about mass mailings and internal communications?